Also available as an e-book and audio book. 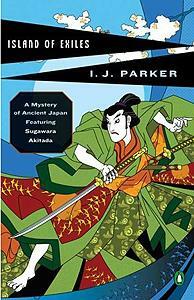 The fourth adventure of Sugawara Akitada begins when two senior officials of the court order him to nearby Sado Island to investigate the death of an imperial prince in exile. Remote Sado Island is noteworthy only for its penal colony and gold mine. When its most illustrious prisoner, Prince Okisada, is murdered and the governor’s son is arrested, the court sends Akitada from neighboring Echigo to investigate. In a covert mission as a prisoner, Akitada clears the accused and discovers a deadly conspiracy but at the cost of falling into the hands of brutal guards and disappearing into the bowels of the earth. Though there seems no hope, Tora, his loyal friend and assistant, begins his own dangerous search of the island. Only endurance and determination ultimately free Akitada to join with Tora and complete his mission successfully and with surprising results.